Vacation rental chalet. Sleeps 8, 3 bedrooms, 2 bathrooms. No pets allowed. 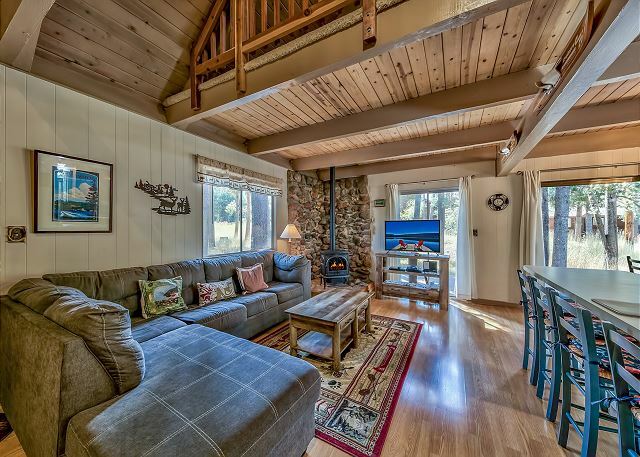 The Atraori chalet features an open living room with a gas stove surrounded by a natural stone hearth, cozy seating, wood floors, natural wood accents and mountain style decor. 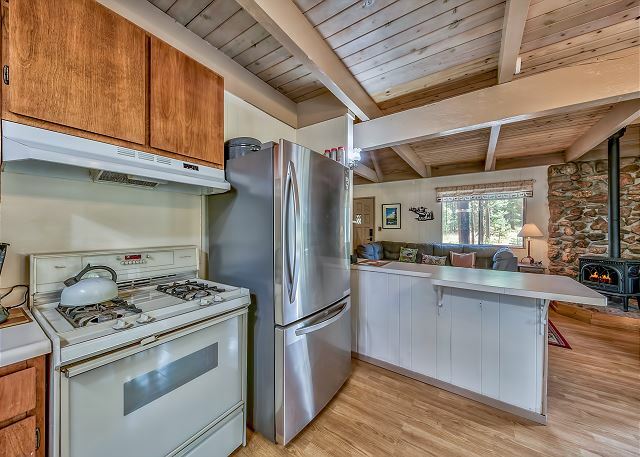 The adjacent kitchen has seating for 4 at the breakfast bar and a dining table that seats four. Efficiently designed so the cook may prepare meals for the family on the gas stove. There are sliders and a door to the deck so the family can have easy access to the hot tub and the wrap around deck. A new hot springs hot tub was just installed 12/20/18! 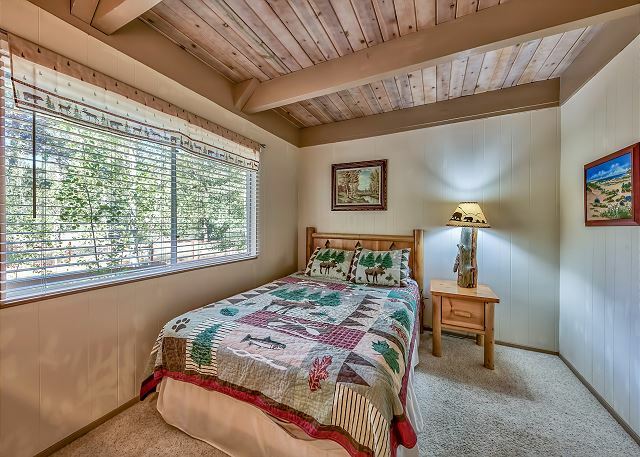 There are two comfortable bedrooms and a full bath on the main floor. The upstairs features a loft with two futons, a great spot for the kids to gather and play (or to using as an extra sleeping area). 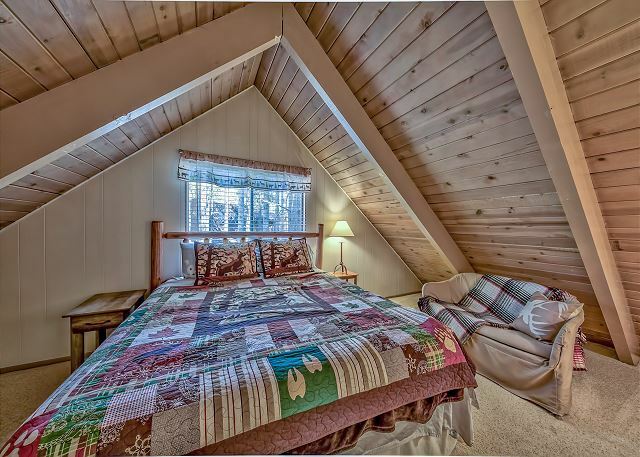 The third bedroom is upstairs with a king sized bed tucked under the vaulted ceiling. 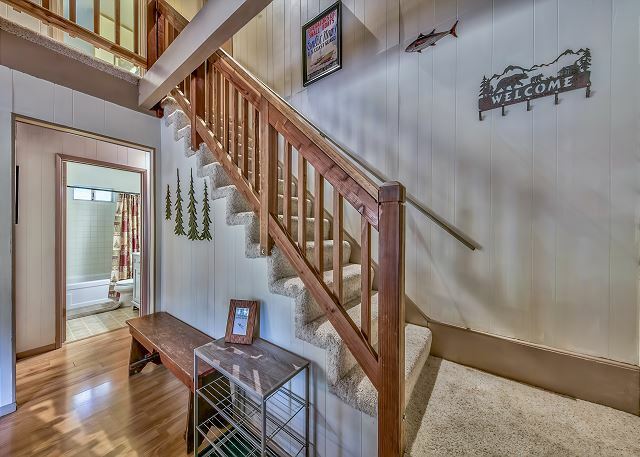 There is a second bath upstairs with a shower stall. The Atroari chalet is conveniently located two blocks off of Pioneer Trail, it's 15-20 minute drive to Heavenly Village, Heavenly Ski Resort and Stateline. It is approximately 20 minutes to Sierra At Tahoe, and 40 minutes to Kirkwood. For the hikers, mountain bikers or other outdoor enthusiasts the trail head to Onedias St/Fountain Place trails is two blocks away. In the winter there are miles of trails for snow shoeing and cross country skiing. The locals favorite community of Meyers is a few minutes away featuring restaurants and shops that include: Getaway Cafe, Meyers Downtown Cafe, Divided Sky, Bob Dog Pizza, Freek Perk Coffee shop and the Holiday Market. shaun H from Portland, OR does not recommend this vacation rental. Thank you for letting us know we will check out the appliances and make sure they are working properly. The cabin was warm when we arrived during a blizzard, which was such a relief. The place is set up perfectly for a relaxing getaway, with a hot-tub, TV w/ netflix and some gaming consoles. Thank you-we definitely had a lot of blizzards this year. We are glad you enjoyed your stay.